Lesser Prairie Chicken Outcomes Becoming Clearer-The Train Tracks are not up to code and the red signal is still on. Over the past two years, CGC has strived to create compensatory mitigation solutions that provide certainty to all stakeholders: proven conservation compensatory mitigation solutions under long proven USFWS conservation banking guidance that reflect the actual cost of successful compliance and full and permanent transfer of liability from industry to our LPC conservation banks, exceptional partnerships with landowners who have a track record of responsible grazing practices, thus a healthy abundance of LPC’s on their property and land trust partners who hold the conservation easements. We have said from the beginning that this business and conservation model would deliver the highest degree of certainty possible. *LPC listed as “Threatened”: Threatened was our prediction all along. With a species extinction curve that looks like a bomb falling from the belly of a B-52 bomber, those that were surprised should not have been. With a combined 25 years of watching the LPC and GPC situation across the Southern Plains, it is woefully obvious that Director Ashe was correct-this bird is in dire straits. Voluntary plans have not worked in the past and while a few leading corporations may have actually followed through on their commitments, you were not going to achieve the scale of behavior change necessary to achieve any meaningful improvement to the LPC situation under a non-listing, purely voluntary scenario. * 4d rule and Oil & Gas industry CCAA approved: Again, zero surprise. It is clear that there was a baked deal between the states and the oil & gas industry early on. On the Range Wide Plan itself, a valiant effort that had all the potential of being the moon shot equivalent for world class regional conservation planning and ecosystem market creation. Unfortunately it also had a some major short comings which we lobbied loudly and publicly to correct to virtually no avail. In the end the deficiencies and gaps were not addressed and the forecasted litigation is now certain. Never the less, we continue to try and help the states meet their 25% permanent objective and help them have a chance of execution of the current plan and hopefully future improvements. *CGC’s Programmatic Bank instrument was approved on May 5th. This is a first as far as we know. Landscape scale conservation banks that will deliver immediate and permanent conservation benefits to the LPC and immediate and permanent transfer of liability to customers are now a reality. The first two bank locations under the programmatic structure are targeted for June approval. Truly a remarkable accomplishment for which I will forever be indebted to our landowner partners our team and the visionaries at USFWS who pointed us in this direction almost two years ago and then worked very hard with us to make it a reality. *I got to hold a Prairie Chicken! : In early April we had a field trip to our bank sites in Kansas with USFWS, hosted by our landowner partners and the wonderful graduate students at Kansas State University. We were fortunate to help KSU trap LPC early one incredible morning on the Prairie. 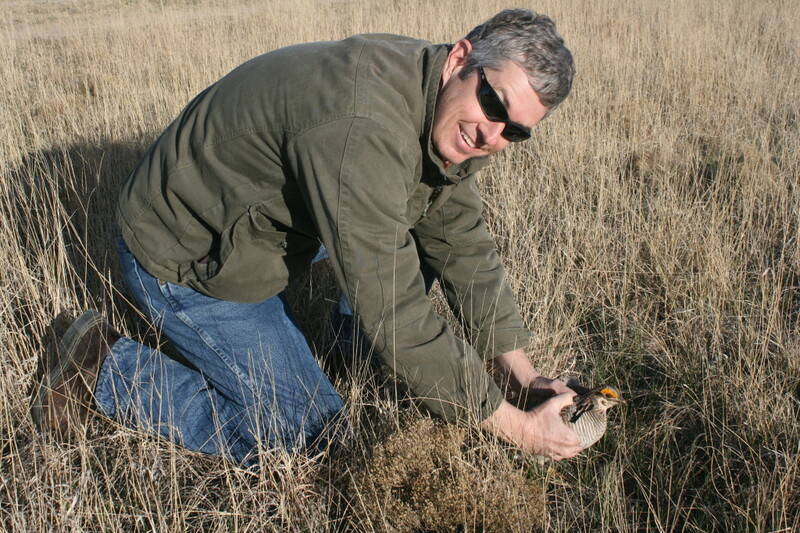 We were able to hold a Lesser Prairie Chicken. I’ve done a lot of really cool things in the outdoors over my 40 something year journey of life but that was definitely one of the coolest and most humble moments I have ever had. When you do something like that the weight of the LPC challenge becomes so real and all the politics, words, unfortunate agendas just all go away for a while. This bird is going to be saved or lost on huge landscapes managed by private landowners and if we don’t properly incentive them and have rigor around conservation standards it’s going to be over for the LPC. Finally, customers. In recent weeks we have had an increased dialogue with some possible customers who are interested in our product and managing the interface with WAFWA in general. Some of these customers are experiencing the “Board moment” or at least the executive team due diligence moment I referenced in my last blog. Political ideology supporting one plan or another without understanding the business and legal risks is just not sustainable. We are eager to help industry members and WAFWA to achieve some early transactional and conservation success but we’ve got to put aside our past professional differences to make this a win for WAFWA, the industry, the LPC and most importantly the landowners. I’m an optimist this can be achieved.